In the poker world, railbird is a somewhat derogatory, slang name for a person who tends to watch poker games "from the rail" rather than actually participate. The rail is what separates the viewing area from the playing floor. Most casinos elevate the viewing area above the playing floor to provide better viewing angles. The audience looks down at the playing area or "the pit," and those at the edge of the viewing area can hang over the rail to watch. Casinos are often societies unto themselves, and regulars mingle with peers on nights when they won't or can't participate. So the rail is a hangout for players who are out of the game or don't have the funds to play at all. In some casinos, the rail is where the dregs of the casino congregate, including alcoholics and degenerate gamblers. If unchecked, this group can be quite inconsiderate, including trying to hustle and borrow from whomever they can. 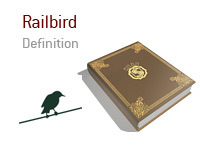 People who are regularly "on the rail," are the railbirds, and they spend their free time "railbirding." At online poker rooms, there is no physical poker rail, but most sites do allow an audience, and the audience usually has access to the chat system. Therefore, online poker players sometimes refer to the chat box as the rail. If an audience member uses the chat system to beg, borrow or bother, then they are the online equivalent of a railbird. The big difference, however, is that players can filter them out or disable audience chat altogether.